The Maltese is considered by some to be the quintessential lap dog. It is gentle, affectionate, and playful, enjoying high energy games in the house. The Maltese does have a more scrupulous, confrontational side that, while not at all dangerous to others, may be dangerous to itself when challenging larger dogs, which it is known to do. Keeping a close eye on the Maltese when meeting unfamiliar dogs is, therefore, a prudent choice. Some Maltese bark quite a bit, while others are more reserved and quiet. In general, they can feel threatened and shy around strangers. The biggest concern with Maltese upkeep is its coat, which needs a lot of attention and is easily dirtied. Maltese for shows can have their coats “wrapped”, thereby protecting it from dirt and damage. Others may want to consider trimming their hair back occasionally, as it will get dirty in certain climates. Their hair should also be combed at least every other day, and preferably daily. 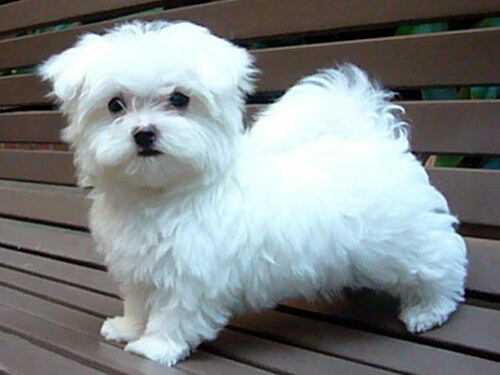 Maltese require some exercise, but this is easily met with daily light play indoors, a run in the yard, or a short walk. The Maltese is generally a healthy breed. They have no major health concerns that are common amongst most of them. Like many other smaller dog breeds, the Maltese can lose its teeth at a relatively early age. Make sure to brush their teeth occasionally, especially the gums, as this area is prone to infection. Maltese also have long hair that can irritate their eyes, leading to problems down the road. This causes the tear glands to over produce, resulting in tear stains on their coat. This area should be cleaned regularly, and become part of daily maintenance. Also keep an eye out for excessive irritation, which can be symptomatic of ulcers. A quick visit to the veterinarian will take care of this, but if left untreated can cause serious eye damage. Be aware that Maltese are more susceptible to knee, eye, and thyroid issues than most, so occasional check-ups at the vet can help mitigate these risks. Some of the more minor issues with Maltese include: patellar luxation, open fontanel, hypoglycemia, hydrophalus, distichiasis, entorpion, and portacaval shunt, although these are relatively rare. The Maltese is one of the oldest known dog breeds in the world. It originated in Malta, with some of the earliest recordings being found in Greek writings from as far back as 300 BC. The Maltese has always been exported to various parts of the world, but the majority of them remained in Malta, which accounts for its ability to remain such a pure breed. Around the 1300’s, the Maltese was introduced to England and quickly became the most popular breed with those of the upper-class, who loved their gorgeous coat and small size. Later, the Maltese is thought to have been threatened almost to the point of extinction. They later bounced back, and they were introduced into the AKC in 1877.